The US Responsibility in Visible and Nonvisible Migration – Stop the Wars at Home and Abroad! The most important thing is to support the migrants who are coming here, not because they want to leave, but because the U.S. has destroyed their future in their countries. The U.S. has had a major role in creating poverty and violence in Latin America for many years. Basically one could say that the countries of Latin America are the personal property of the U.S. which they mold to their needs and oppose all resistance. The recent migrations are a result of U.S. political and economic activity that has constructed a southern empire for the US. Migration from Mexico and Central America is not new, we are just seeing a new wave due to the increased inhumane conditions in these countries, especially Honduras, Guatemala and El Salvador. But in terms of migration one cannot ignore the internal migrations of South America where people migrate within the country to look for food and to flee the violence. 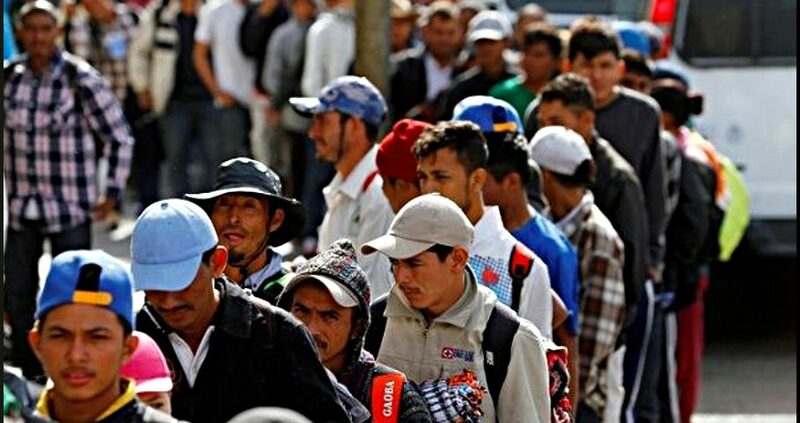 They do not have the option of migrating to the U.S. Colombia has a rampant internal migration or displacement of over 8 million in the past few years where the US has invested billions of military dollars. Venezuela, due to U.S. sanctions, has been the stage of large migrations to other Latin American countries where the U.S.-backed governments do not welcome them. Brazil has had enormous peasant migrations from the north to the south due to unspeakable poverty. There has been massive migration from Puerto Rico, Haiti, Jamaica and the Dominican Republic over many years just to name a few. Today the world is watching the new wave of migration because people organized by the thousands to march from El Salvador, Guatemala and Honduras to demand that the U.S. take responsibility for what they have created; societies that are unfriendly and repressive to working people, where hunger and violence are the daily bread, places where children are not safe and suffering from malnutrition. 1) Install and finance illegal right-wing governments that are only interested in enriching their own class in exchange for practically gifting their countries to the U.S. for political and economic interests. 2) Finance and train their police and military for internal repression of any resistance. 3) Fund and promote paramilitary forces that suppress, terrorize and murder indigenous and peasant populations. 4) Steal land in order to exploit natural resources. 5) Create a financial dependency on the U.S. through high interest loans. Control the media with lies, creating a strong urban right wing which supports pro U.S. politicians. 6) Control resistance through financing NGOs, traditional as well as evangelical religions, schools, books, TV programs, etc. 7) Force privatization of public services and education for the benefit of U.S. companies.Close U.S. borders and criminalize migration as well as migrants within the U.S.
8) Dominate internal markets controlling access to basic necessity goods and services with high prices. 9) Criminalize electoral candidates who might somehow threaten the hegemony of the U.S.
10) Exploit the land and resources with no ecological responsibility, destroying the flora and fauna. 11) Demand changes in labor laws that hurt the workers so that the government has more money to pay the IMF and other loans. 12) Create a sophisticated intelligence program in the countries enabling control of possible “enemies” of the U.S. The list goes on and is definitely incomplete. Many books have been written on each one of these themes. But for us today, the most important thing is to take a stand and support the migrants who are coming here, not because they want to leave, but because the U.S. has destroyed their future in their countries. What can we do for these people? We can keep ourselves and friends informed, help with physical needs such as food and clothing, attend public rallies and above all denounce the U.S. loud and clear for creating this situation.